Alaskans Own fisherman Gregg Jones of the F/V Sea Miner unloads his catch of coho salmon. Photo credit: Alyssa Russell. Buying seafood can be complicated. Where was it caught? When was it caught? How was it caught? Who caught it? Oftentimes, shoppers are left with no clear answers to these questions, which is why small-boat fisheries and others around the country have begun to develop solutions and adopt new technologies to increase consumer access to higher quality, more traceable seafood. Fishermen Wendy and Jason harvest spot prawns for Alaskans Own aboard the F/V Ocean Cape. Photo credit: Alyssa Russell. With the help of community-based coalitions such as Local Catch, fishermen around the country have begun to adopt new distribution systems for bringing their catch directly to consumers. One of the more successful and popular models is a Community Supported Fishery (CSF), which makes buying local seafood easier for consumers and also creates new, higher paying markets for local fishermen. Similar to Community Supported Agriculture (CSA), CSFs entail fishermen selling their catch directly to consumers (i.e., no “middlemen”) and require CSF “members” committing to purchase a certain quantity of seafood and paying for their seafood in advance of the fishing season. The result is that fishermen know that they have a ready market before they go out fishing, have the capital available before the fishing season to buy/maintain fishing equipment, and consumers know that they have a guaranteed source of sustainable seafood that they can trust. Over the last decade, CSFs have emerged all over the country and have taken on a variety of forms, including business structures, distribution methods, and goals. This variety in CSFs reflects America’s diversity of fisheries and coastal communities; no one size fits all. One of the first CSFs in the country was launched in 2009 by the Alaska Longline Fishermen’s Association (ALFA) in the small fishing community of Sitka, Alaska. The first CSF established in Alaska, Alaskans Own, was created as a way to make local, traceable, sustainable seafood more accessible to Alaskans. Alaskans Own also generates funding for ALFA’s Fishery Conservation Network, which improves best fishing practices in ALFA’s fleet and increases the viability of small-scale fisheries; 100% of Alaskans Own’s profits go the Fishery Conservation Network. Today, Alaskans Own distributes its fish through CSF subscriptions, bulk buying clubs, and “pop-up” markets and in 2018 served nearly 150 families. The result has been a growing network of consumers and fishermen who are invested in the future health of Alaska’s small-boat fisheries and coastal ecosystems. When it comes to seafood products, one of the central questions that every CSF has to answer is whether or not it will distribute fresh or frozen seafood. This might seem surprising for consumers who have been told for years that fresh fish means better quality fish. As it turns out though, the exact opposite is often the case: frozen is fresh. A growing number of fishermen – especially those with smaller boats – are taking extra measures on their fishing vessels to properly handle, bleed and chill their fish so that the quality of the fish is maintained as soon as it leaves the water. 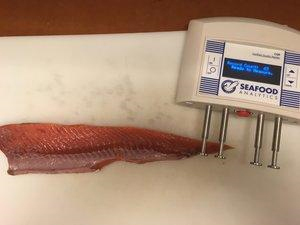 Seafood Analytics’ CQR device quantifies how “fresh” a fish is. 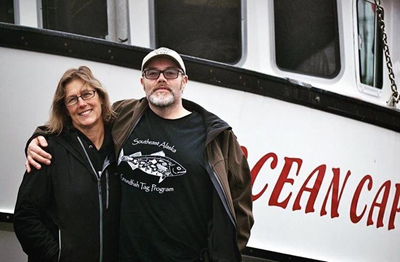 To test the quality of frozen fish and consumer perceptions about seafood, several small-boat fisheries/CSFs teamed up with Oregon State University, Seafood Analytics, and Ecotrust. To measure the quality of the fish, Seafood Analytics used a “CQR” (Certified Quality Reader) device to quantify the fish’s freshness. The results were telling: flash-frozen fish measured higher in quality and freshness than the “fresh” fish sold in local grocery seafood cases. Consumer taste buds reinforced their findings, and in a taste-test experiment consumers preferred frozen fish over conventional “fresh” fish. Read more about their research results. Thanks to small-boat fisheries developing new seafood distribution models like CSFs and adopting better seafood handling practices and technologies, consumers can now enjoy higher quality seafood and feel confident in knowing where it came from and how it was harvested. Just another reason to stock up your freezer for the long winter months ahead.